Even though certain elements of each campaign differed slightly, with different XOR key values being used, they all exhibited common features. The email campaigns that were attempting to distribute this malware were using standard spam characteristics. The subject lines were mutated with a random string of digits but started with either "Copy_" or "Document_" for example "Copy_30396323" and "Document_3758". While we were monitoring these campaigns, we saw multiple campaigns being launched, each with slightly different themes. The body of the email associated with the initial campaign was blank with a single attached file named "nm.pdf" an example of the campaign is shown below. "Image data in PDF format has been attached to this email." In each case, the file attachment was a malicious PDF document with an embedded Microsoft Word document. When victims open the PDF, they are greeted with a message in the body of the PDF, which will then attempt to open the embedded Microsoft Word document. 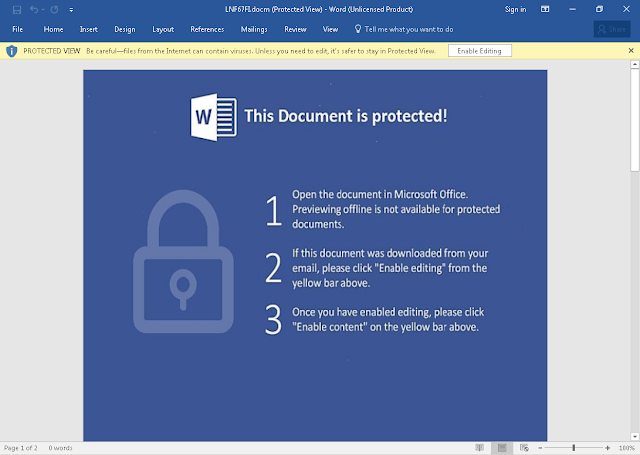 Similar to what we saw with recent Locky campaigns, when the PDF attempts to open the embedded Microsoft Word document, the victim is prompted to approve the activity. Requiring user interaction to continue the infection process could be an attempt to evade automated detection mechanisms that organizations may have deployed as no malicious activity occurs until after the user approves. In sandbox environments that are not configured to simulate this activity, the infection may never occur, and could result in the sandbox determining that the file is benign when the reality is that it is malicious, the infection was just simply not triggered. Clicking the OK button causes the PDF to open the malicious Microsoft Word document which looks similar to what we have grown accustomed to seeing from campaigns like this one. As can be expected, the user is also prompted to Enable Editing in order to view the contents of the word document. One thing to note is that the malicious Microsoft Word document contained two pages rather than just one like a lot of maldocs. Once the malicious content is enabled, the Microsoft Word document will then execute a VBA macro that functions as the actual ransomware downloader and will attempt to retrieve the ransomware binary to infect the system. The VBA Macro contains multiple download domains which are separated with a capital 'V', this gives the malware multiple opportunities to download the malicious payload from multiple sources. The URL used to download the Jaff binary is very similar to what we are used to seeing from Locky as well. The ransomware iterates through folders stored on the system and encrypts them. The file extension associated with this particular ransomware which is appended to each file is "jaff". The ransomware writes a file called ReadMe.txt into the victim's "My Documents" directory that contains the ransom note. It is interesting to note that the instructions do not appear to instruct the user to make use of any sort of Tor proxy service such as Tor2Web, instead instructing the user to install the full Tor Browser software package in order to access the ransom payment system. The Tor address being used across samples and campaigns also does not appear to be changing. Visiting the ransom payment system results in the victim being greeted by the following application which requires them to input the decrypt ID listed in the ransom note on the infected system. After entering the appropriate ID value into the website, the victim is taken to the full instruction page that specifies the ransom amount the attacker is demanding, along with instructions for making the payment. It's interesting to note that the look and feel of the ransom payment system looks very similar to what we have seen from Locky. 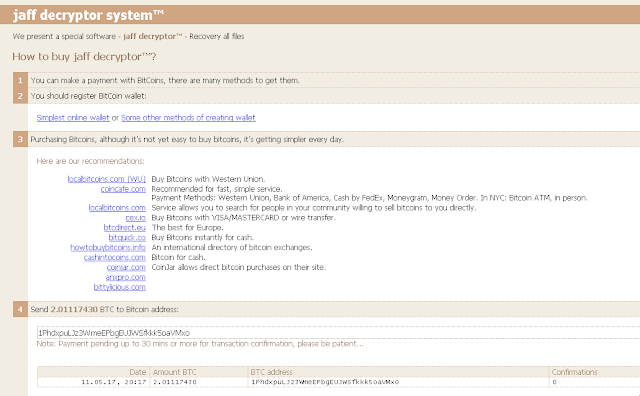 In this particular case the ransom amount being demanded was 2.01117430 in Bitcoin, which at the time of this writing was approximately $3700, which is significantly higher than that demanded by other ransomware families operating across the threat landscape. In looking at the bitcoin wallet specified on the ransom payment server, we confirmed that there are currently zero transactions associated with this wallet. Talos observed over 100K emails (so far) related to these new Jaff campaigns. This is a significant rise in ransomware delivered by spam for such a new actor. Their immediate relationship with Necurs has allowed their spam campaigns to reach impressive volumes in a very short period of time. The initial spam campaign began on May 11, 2017 at 0800 UTC and consisted of roughly 35,768 messages all containing the attachment "nm.pdf". Talos observed approximately 184 unique samples within this spam campaign. Talos also observed a second campaign that began overnight consisting of approximately 72,798 emails. This campaign began on May 12, 2017 at 0900 UTC and was observed to be distributing approximately 294 unique samples. The attachment filename associated with this second campaign was "201705*.pdf" which functioned identically to the initial campaigns we observed. There are certain characteristics associated with both the campaigns being used to distribute Jaff and the C2 traffic patterns it uses that are similar to what we've become accustomed to while monitoring Locky and Dridex activity across the threat landscape. However we are confident that this is not simply a new or "retooled" version of Locky ransomware. 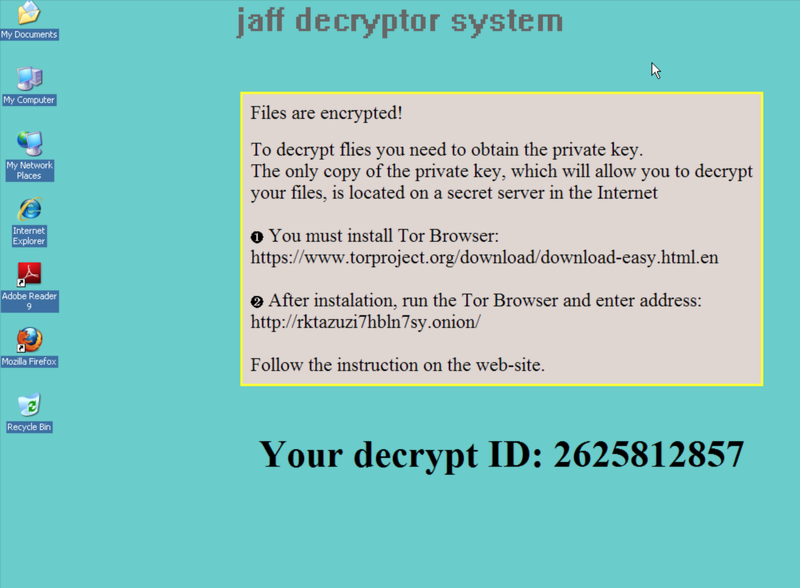 There is very little similarity between the two codebases, and while it is possible that the same actors who once used Necurs to spread Locky has switched to distributing Jaff, the malware itself is distinct enough in nature that it should be treated and referred to as a different ransomware family altogether. If anything the reason this can be considered the 'new' Locky is purely due to it's rampant appearance, similar to Locky it came out of nowhere with a huge bang, it spread via email malspam primarily, it leveraged maldocs, but traits of a campaign are not used to determine if the malware is the same. This is a new piece of ransomware with a significant effort having been put into the codebase, the infrastructure and the volume. However, that does not make this Locky 2.0. It simply makes it another, new and aggressive adversary pushing their ransomware product to end users, this should be considered, for now, separate from Locky. We've now seen that Necurs is being used to push Jaff in the form of multiple high volume spam campaigns. We will continue to monitor this as we do with every email based threat to determine whether this is a fly-by-night occurrence or whether this ransomware family will continue to infect organizations who are not properly protected. A list of attachment hashes associated with this campaign (PDF & DOC) can be found here. 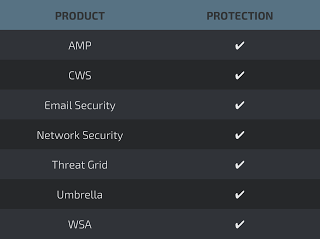 A list of distribution domains associated with these campaigns can be found here. This is yet another example of a new ransomware variant being unleashed on the world. This occurrence is becoming far too common and shows why this is such an attractive avenue for miscreants. There are millions of dollars at stake and everyone is trying to grab a piece of the pie. 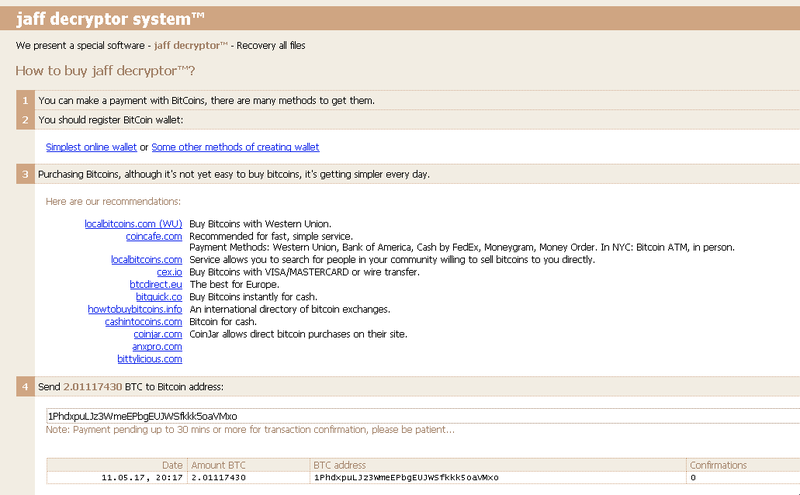 Jaff is being distributed through a common mechanism, Necurs based spam. However, it is asking for a fairly large ransom of $3700. The question is at which price point does it deter users from paying. In the future we will likely see adversaries continue to try and find the sweet spot, maximizing profits without sacrificing ransoms paid. In today's threat landscape ransomware dominates and is being pushed onto systems around the world in every way possible. With the large scale decrease in exploit kit activity its likely going to continue to be heavily distributed through email as well as being delivered as a secondary payload when adversaries manage to penetrate a network or system, in the case of threats like Samsam.